On May 25th 2013, Ablogtowatch.com published an article titled Timezone.com Founder Worries About The Fragility Of High Watch Prices by Richard Paige. The author, a veteran of the watch industry, questions the steep rise in Swiss watch prices over the last few decades. Richard Paige cites an evolutionary hypothesis called the Red Queen Effect, based on which a system needs to keep adapting and evolving in order to survive in an ever-changing environment. According to the founder of Timezone.com, the technological advancements brought to watchmaking in the last decades should have translated into lower prices for the exact same product. Richard Paige draws a parallel with the consumer electronics industry, where products of Apple Inc. keeps innovating one product generation after another by offering more performance… without substantially raising the price. The exact opposite seems to happen in the watch industry, observes Timezone’s founder, where the cost of an Omega Speedmaster rose from USD 225 in 1973 to USD 4500 in 2013. The Gold Standard is a monetary system based on a standard of gold that remains unchanged in content and quantity throughout decades. As Richard Paige mentions, the Omega Speedmaster Professional has kept the same specifications between 1969 and 2013. Besides improvements in water-resistance gaskets and lubricating oils, most of the components of a 2013 Speedmaster Professional are made with the same alloys and materials today as used back in 1969. To see how much R. Paige’s claim of unjustified price rise holds, I have attempted to take into consideration the economical and marketing aspects of this product. Before anything else, I need to outline that Switzerland is located in the European continent, but is not a member of the European Union. It did enter the European Free Trade Association in 2004, adopted a common visa policy with 25 other European countries and abolished passport and immigration controls at their common border. Switzerland still has sovereignty over its currency, constitution and tax laws. The obvious flaw in Richard Paiges’ parallel between consumer electronics and watchmaking is that the first benefits from Moore’s law while the latter doesn’t. In a 1965 paper, Intel co-founder Gordon E. Moore speculated that technological advances would allow the industry to double the amount of transistors on an integrated circuit every year and that postulate has so far proven to be very accurate. The law also helps to explain how Apple Inc. can manage to increase the performance of its consumer electronics products without raising prices. In watchmaking, Moore’s law helps to explain how Casio can keep on adding features to its electronic G-Shock collection, but the law cannot be applied to the field of mechanical watchmaking, where Omega’s Speedmaster falls into. In this essay, I will try to look at the question from another angle: historical hourly wages and real estate price in Switzerland. The nominal value of a Speedmaster at a specific point in time could be expressed in work hours necessary to earn sufficient funds to purchase it. I am not an economist, so I welcome comments or corrections from experts in the field. 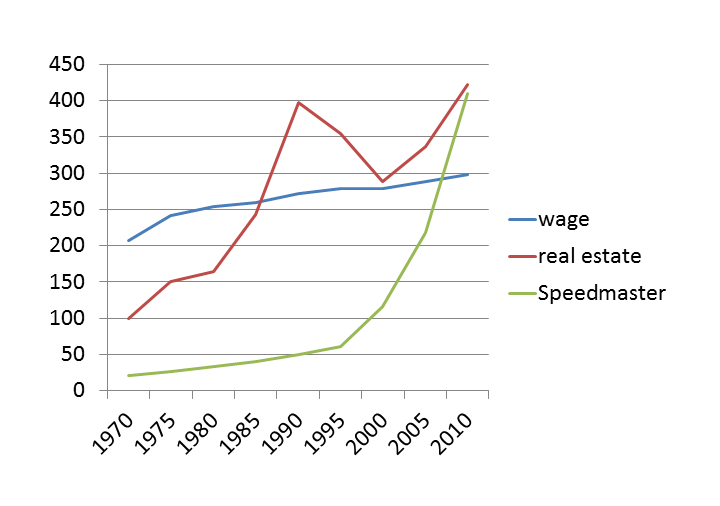 The graph below combines the minimum Swiss wage based on official Swiss government data, the average price of real estate in Switzerland according to the Swiss Central Bank and the price of the Omega Speedmaster Professional between 1970, 1995 and 2013. Based on the Swiss government data, wages followed a linear increase between 1970 and 2013. The evolution of real estate price followed a boom-and-bust curve, reaching a peak in 1992 before collapsing and rising again in 2000. The green curve, showing the price of the Speedmaster, follows an exponential curve that steeply rises between 1995 and 2000. There are several factors behind this sudden change, namely: brand re-positioning, “planned” components scarcity and basic rules of supply and demand. I used the overall average O43 Real Estate Price Indices from the Swiss National Bank for historical prices of real estate in Switzerland. Employment laws are very liberal in Switzerland and unions are not very powerful, so officially there is no such thing as a minimum wage like in neighboring France. That being said, the country is currently debating the possibility of running a poll on a CHF 22 minimum wage before the end of the year 2013. I extrapolated earlier wages by combining the CHF 22 figure and historical Swiss Wage Indexes. Following the 1983 merger of the ASUAG and SSIH, the new consortium was named SMH (Swiss Corporation for Microelectronics and Watchmaking Industries Ltd.), and renamed Swatch Group in 1998. Between 1992 and 2003, marketing guru Jean-Claude Biver was entrusted with the mission of restructuring Omega. Mr. Biver had previously managed to revive the bankrupt Blancpain company and re-position it as a high-end luxury brand before selling it to the Swatch Group. It is very likely that Biver was involved in the decision to turn Omega into a Rolex competitor. The first step consisted in heavily investing in and creative product placement. 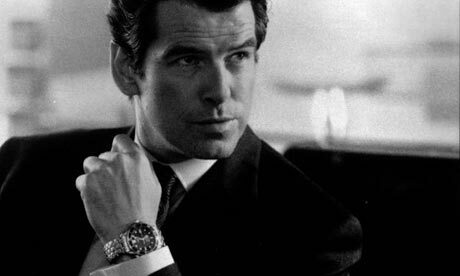 As a consequence, most of us saw actor Pierce Brosnan wearing an Omega Seamaster in the 1995 Goldeneye. Omega watches have been featured on James Bond movies since, heavily contributing to the popularity and desirability of the brand. The second step of Biver’s plan involved raising the perceived value of Omega watches by developing proprietary movements. In 1999, the brand introduced new lines of movements built around Master Watchmakers Roger Daniels’ co-axial escapement. The system was first thought by Abraham-Louis Breguet, but manufacturing technology in the 19th century did not enable to build it. Taking over from Jean-Claude Biver, Omega’s new CEO Stephen Urquhart followed the policy of mechanical appropriation and oversaw works on improving the reliability of the co-axial escapement and the extension of the technology to all new Omega calibres. With this, Omega tries to compete with Rolex, which exclusively uses proprietary movements. Between 1998 and 2012, the so-called “Hayek pool”, increased they stake in shares from 35.5 % to 41.3 %. While basically holding the reins of the conglomerate, they decided early on to keep all internal brands from fighting with each other. 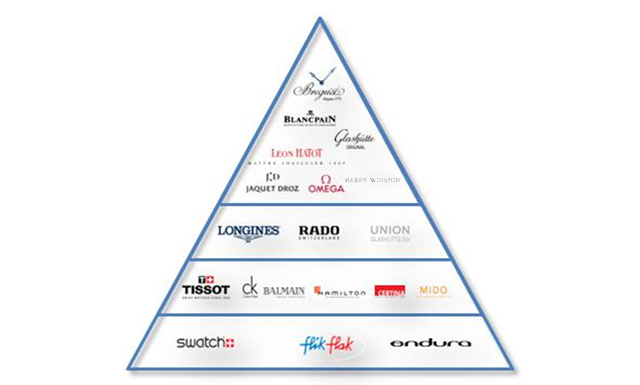 As a consequence, they assigned to each brand to a specific price segment, and Omega received the top position in the mid-range segment; before being raised to its current bottom position in the high-end segment. Since all other collections from Omega were positioned at much higher prices, it would not have looked good for the brand to have an iconic collection like the Speedmaster with a price tag woth half of any other collection. Back in 1968, the Speedmaster received a simplified cam chronograph designed by Lemania. Lemania had been with Omega and Tissot within the SSIH conglomerate since the aftermath of the 1929 Stock Market Crash. Between 1981 and 1991, Lemania was passed on from one owner to another started losing market shares to competitor Valjoux’s, who had a more competitive automatic chronograph. I use the verb “Planned” intentionally because when the Swatch Group managed to buy back Lemania in 1999, and decided to stop supplying calibres 1340, 1873 and 5100 to third parties. Those movements were not in high demand as the Valjoux 7750, and the late Nick Hayek Sr. has always argued that the volumes purchases by brands like Sinn and Tutima were not enough to keep it profitable. Today, Lemania still produces the 1340 for Breguet and the 1873 for Omega. The 5100 was modified to incorporate more plastic parts and be used by Swatch, but the Lemania factories are now building high-end movements for Breguet. Due to heavy investment in advertising and creative product placement, Jean-Claude Biver seems to have managed to turn Omega into a very desirable brand. The industrial phase carried on by Stephen Urquhart helped establish the brand as a quasi-Manufacture (using proprietary movements). As a consequence, people are willing to pay more for the brand. In parallel, the Swatch Group continues to produce the Lemania 1873 exclusively for the Speedmaster. If we believe their claim of lack of profitability of this calibre, it could cost up to 3 x more to produce it in small quantities. That being said, the Speedmaster is an icon, and every store that sells Omega watches has one on display, so it is safe to say that Omega still manages to make them and sell them like hot cakes. My conservative estimate is that the production cost is somewhere around 2 x the normal value. A Swiss worker needed to work 2 days (14 ½ hours at CHF 14.93 p/h) before he could purchase the CHF 215 Speedmaster. With the same money, he could have acquired 2 m2 (square metre) in a residential area in Switzerland. The same worker would have had to work 4 days (30 ½ hours at CHF 20.12 p/h) before he could buy the CHF 615 Speedmaster. That amount of work would have bought him 2 m2 (square metre) in a Swiss residential area. Our worker would now have to work 23 days (186 hours at CHF 22.00 p/h) before contemplating the purchase of a CHF 4,100 Speedmaster. With the same money, he could almost buy 10 m2 (square metre) in a Swiss residential area. Comparing the Swiss Minimum Wages, the real price of a Speedmaster has been multiplied more than tenfold over 40 years. base on the Wage only, the modern price of a Speedmaster should be CHF 319… which is pretty much what one can expect to pay for a discounted Chinese Seagull Chronograph. But if we consider that between 1970 and 1995 the price and hours total increased by 2 or 3, a linear increase should position the Speedmaster between CHF 1’200 and 1’800 today. Anything beyond is an arbitrary choice from the brand… that complies with a price segmentation decided by the group’s board of directors. I really enjoed reading this great article. It’s an argute and very well documented micro economic analysis . 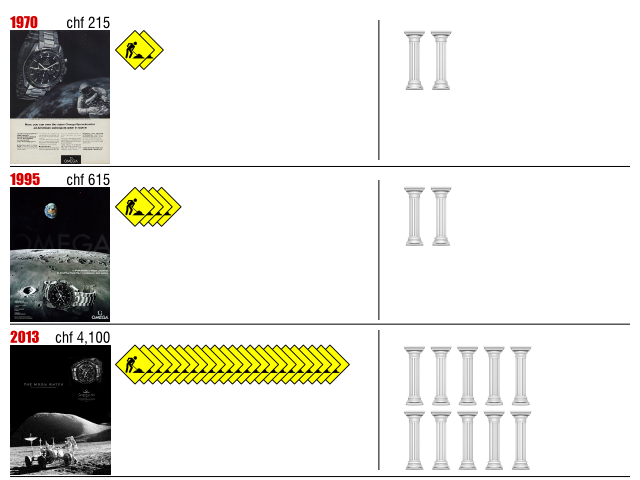 A useful parallel might be drawn between the art market and haute horologie–they both seem to permit dramatic price spirals based purely on intangible properties having nothing whatever to do with the thing in itself–things like reputation, historical narratives, perceived desirability, brand image, etc. btw: Great blog! Very well organized, readable and authoritative. Thanks for taking the time to share. Only downside: reading these pages is keeping me up late. Yeah but the Speedmaster, though a fine wristwatch, is neither art, nor is it haute horlogie. It would be great conceit to categorize it is either. Although I do think many brands do increase prices to often…..we can also see how they have dropped some prices since the Swiss frank increase earlier……..I must point-out that in my 1975 catalogue price was CHF 520.- on steel and 495.- on leather. I just thought it was important to point out some other prices.